Have you ever wondered what goes on in the minds of other people? Now, you and I are way above average so our minds obviously operate on a higher plane than almost everyone else. Gazing down from our enlightened perch can be interesting though. Chocolate milk is simple, but government can be a head-scratcher too. We often hear “run government like a business,” and two of the main proponents of that philosophy are Kentucky senators Rand Paul and Mitch McConnell. The question is, to a thinking person, why would anyone listen to these guys? “One of our worst performing states is Kentucky. WalletHub identified Kentucky in 2017 as the state most dependent on the federal government. In fiscal 2016, the federal government collected $33 billion in taxes from Kentucky but spent $89 billion there — resulting in a net benefit to Kentucky of $56 billion (more than $12,500 for each person in that state). Kentucky’s median household income is $44,000 a year, while the national median household income is $54,000 a year. The portion of Kentucky’s population living in poverty and presumably using federal programs (such as food stamps) is above the national average.” If Kentucky was a business it would have been bankrupt long ago. Wow, some thinking can be a tad harsh, eh guys? It's enough to inspire a man to try to do something to impress his significant other. If so, guys, you may want to avoid the Downtown Hotel in Dawson City in the Yukon as a date destination. This may be the ultimate “what-are-they-thinking” spot on the planet. You see, their signature drink is the Sour Toe. 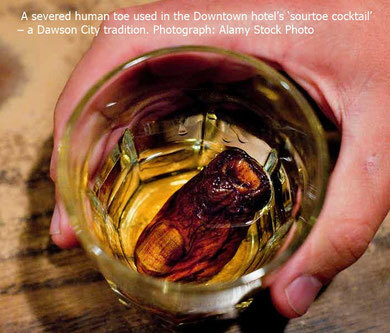 “The Sour Toe cocktail is a shot of whiskey with a blackened toe – nail and all – bobbing inside. Those who manage to touch the gnarled, severed toe to their lips earn a certificate.” My guess is this is not an accomplishment that would make a lady want to kiss you.